The April Making A Mark Poll looked at Have you bought a painting DVD? Right click the image to open a larger version of the chart. 20% said the main reason why they don't buy painting DVDs is the cost - they're just too expensive. more people would use this format for learning more about art if they cost less. 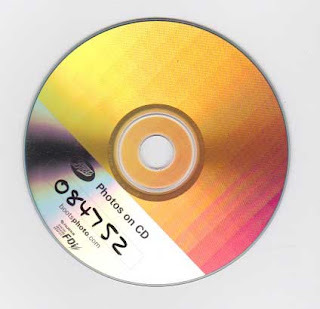 The interesting aspect for me is how much the sale of art DVDs will change now that we have more smaller and more mobile laptops and and computers equipment like the iPad available. I predict that producers of art DVDs are going to have to get to grips with the type of technology which makes films about making art much more accessible. They certainly need to review pricing models and to work out how people can buy an art DVD in much the same way they can currently buy a track or album from iTunes. Frankly, there simply isn't a need to deliver all films about art on a DVD - and the pricing should certainly reflect this. Tomorrow's post will be about a new Making A Mark opinion Poll for June. Posted by Making A Mark on Monday, May 31, 2010 2 comments Who's linking to this post? 30th May 2010 - Who's made a mark this week? 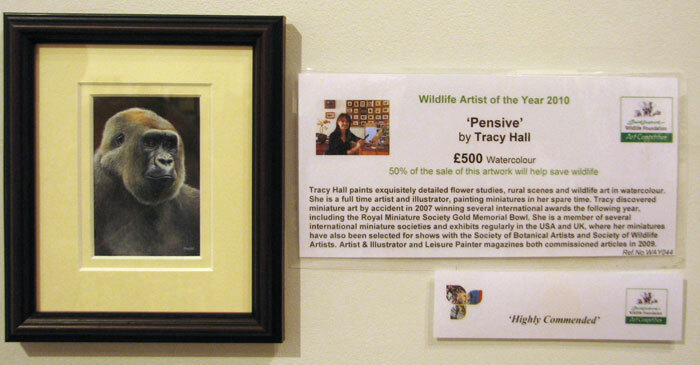 Congratulations to two gorilla artists I know. 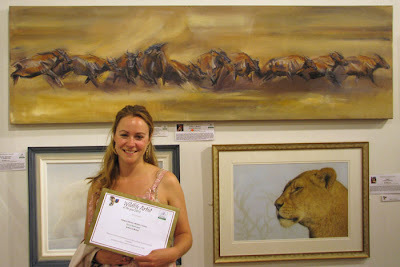 Tracy Hall (Watercolour Artist Diary) got a Highly Commended with her very first entry to Wildlife Artists of the Year. You can read her blog post here wildlife artist of the year exhibition. Leslie Evans (Chisaii) had three coloured pencil works in the show - shipped over from the USA. She also got a Highly Commended for her gorilla and her giraffe - and both of them also sold which should help with the shipping costs! The rest of this blog post has pictures from the exhibition - to give you an impression about just how many people attend on the Private View night and how fast the works now sell! This is of course to encourage all you wildlife artists to enter next year's show! This is Jan Harbon's blog - she won the People's Choice award at the recent Annual Exhibition of the Society of Botanical Artists and was exhibiting last week at the Chelsea Show. Lynne Chapman (An Illustrator's Life For Me!) has been visiting the Antiques Road Show and of course sketched throughout! Lynne also participated in her very first International Sketchcrawl recently - and you can see the result in Wakefield Sketchcrawl. It all sounds as if it was really well organised and now Lynne is promising one for Sheffield. Charley Parker (Lines and Colors) recently wrote an appreciation of the very fine pastel portraits of German artist Simone Bingmer - this is her website. The use of pastels for poirtraits has a very long tradition and it's one which has not yet received any coverage on this blog - so that's one topic sorted for the future! Three UKCPS members have got together to have an exhibition in Glastonbury - you can read more about how they are getting on in Glastonbury Exhibition on Pauline Longley's Art Blog. I have been surprised at how difficult these little paintings are and my appreciation for them has grown substantially after this experience. On Watermarks, Jeanette Jobson (Illustrated Life) celebrates getting a grant for a A fishy project to produce a body of work in gyotaku (fish rubbing) using species found in Newfoundland waters. She will also be offering a workshop next spring to share what I have learned with other artists. Art Business Book Opinion Poll: Please respond to this survey Which is the most helpful art business book? edward_ winkleman writes about The Value of Nothing and The Dare of Anonymity - The Anonymous Art Show is an intriguing idea! His article was prompted by an article on artnet - Dust to Dust by Matthew Bown about What we pay for art, what it means, and where that value comes from. "Since the material value of art is negligible, we’re paying for something - but what?" Galleries: Barney Davey (Art Print Issues) posted about Visual Artist’s Challenge: Should I Work with Galleries, Go Direct to Collectors or Both? Blogging art: a nice post 6 Blog Post Ideas For Art Bloggers by Alyice Edrich on Empty Easel. Succinct and to the point. Exhibiting art: AIR - Introduction to One-off exhibition insurance - a Policy for AIR members who want to take out one-off insurance cover for artwork whilst in transit to/from and whilst on display at an exhibition. The New YorK Times Room for Debate Blog asks Can Art Be ‘Priceless’ in Rocky Times? Judge Pauley also took the opportunity to deliver a harsh verdict on the art world: “This lawsuit offers an unflattering portrait of the art world—a realm of self-proclaimed royalty full of ‘blacklists’, ‘graylists’ and astonishing chicanery.”....In the end, Judge Pauley offered Robins and all collectors the ancient advice of “buyer beware” and “get it in writing”. The Independent highlighted the fact that Banksy's works pawned by Europe's art patrons. It appears pawning your assets isn't something just done by the less well off. Kurt Jackson's paintings will be exhibited at The Bargehouse on London's South Bank (OXO Tower Wharf) from 2nd - 6th June, 11am-6pm (admission free). See Kurt Jackson - An artistic taste of Glastonbury. He has created an amazing series of paintings and sketches from his residency at the 2009 Glastonbury Festival, which include portraits of Radiohead, Massive Attack, Lily Allen and Tinariwen as well as landscapes capturing the essence of the festival. 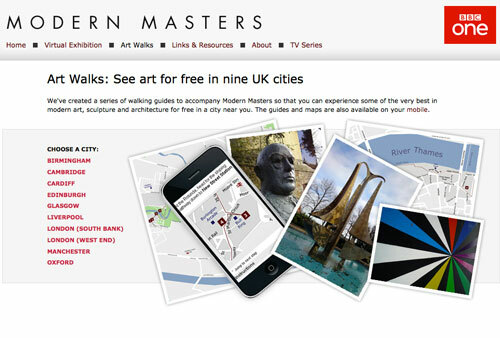 Have you tried the Modern Masters - Art Walks in UK Cities? We had a discussion about it at my Drawing Group on Friday when one of my group learned all about what a podcast is! 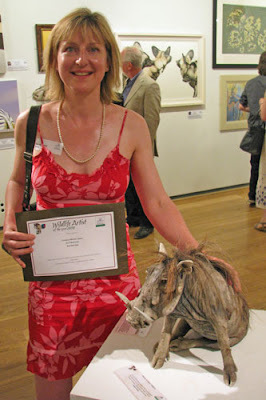 If you're planning a visit to the Patchings Festival 2010, (10th-14th June) make sure you go and visit Gayle Mason SOFA (Fur in the Paint) who is exhibiting there for the first time since she became a full time artist and tutor. Surrey Open Studios runs from 5th - 20th June. These are all the artists taking part. This is where you can find them (on a map of Surrey). Check out Marion Willcocks a fellow member of the Drawing London Group and her husband Paul Wilcocks who produces wonderful pieces in wood. A flat light for a flat surface: a good thing to use for this is two direct light sources that can be reflected off a white or bright surface. A perfect surface to use is a large sheet of paper to reflect the light source on the subject placing an even light onto what is photographed. Stapleton Kearns (Stapleton Kearns) has a view about Projectors? Ester Roi has got a great demonstration of the use of Sanded Pastel Paper and the Icarus Board or what happens when you use heat and colour shapers! The Telegraph reports that an art expert opines that Botticelli's Venus and Mars were 'high on drugs'. I shall start looking at plant specimens in paintings with a new perspective! Meanwhile in the same paper it is suggested that From Botticelli to Hemingway, artists have always been seduced by drink and drugs. I do get a bit miffed that there's an implicit 'all' in that sentence! A plant being held by a mischievous-looking satyr in the bottom right corner of the painting has been recognised as a specimen of Datura stramonium, a plant which causes madness and the urge to take one's clothes off. Marion Boddy Evans the about.com:painting guide has written an article about Before You Select a Painting Holiday or Workshop. A little while ago Derwent sent me a new pencil wrap to try and on Monday I posted my Product Review: Derwent Pocket Pencil Wrap. Definitely recommended for the minimalist artist. Tina Mammoser (The Cycling Artist) is reviewing her practice regarding varnish and would like some help with researching a better way of getting her paintings varnished and avoiding solvent based varnishes. What's your favourite Art Business Book? On Wednesday, I published a new "resources for artists information site called "The Best Art Business Books". You can read the reasons why in this post in Making A Mark Reviews - but some of you will recall my recent rant about Amazon assigns ludicrous categories to Art Books (11 May 2010)! The Top Ten Best Art Books in May - I'd have never known about four of the best selling books in May if I hadn't idly decided yesterday to check out what were the top selling fine art books. Which is why I have a new information website Makingamark's Top 10 Fine Art Books which I'm going to try updating once a month across 5 categories. It's very much my version of the rankinsg after I've excluded all the books which aren't about fine art! Two books will be identified - the top ranked in critical terms and the best selling. I'll be doing an amazon.co.uk version on the recommended art books page of my website. Q. how many of your projects are sanctioned these days--and how many are, shall we say, extra-legal? On Tuesday, I'm launching the Making A Mark Opinion Poll for June. I had a brilliant idea for this one - let's just hope I wrote it down somewhere as I can't remember what it is right now! Facebook announced its new privacy settings yesterday - this is the official explanation Making Control Simple on the OFFICIAL Facebook blog. That just left me thinking that Mark Zuckerburg (age 26 and a few days) needs to grow up and learn how to say "Sorry - we got it wrong!" Is anybody else experiencing huge fluctuations in their Feedburner numbers? I'm gaining and losing c.1,000 subscribers on a regular basis for the last week or and can't track down what the problem is. It appears to be Google Reader which is causing the problem. My cyber chum and popular ex artist Maggie Stiefvater (Words on Words) is still finding time to make art inbetween morphing into a New York Times best selling YA author with her books now sold in 30 countries. Her giveaway to mark the imminent launch of her 4th book Linger is a guitar decorated with celtic artwork based on the themes of "Linger" and done with Sharpies (some 12 to be precise). The guitar will be raffled at the launch party at Barnes & Noble in Williamsburg Virginia on July 20th at 5pm. Posted by Making A Mark on Sunday, May 30, 2010 4 comments Who's linking to this post? If you want to know how to find out which are the top rated and/or best selling art books in May - read on! I'm still intrigued by the listings in the categories used by Amazon and how difficult it can be to see which are the top rated and best selling art books. So I've created my own listing Makingamark's Top 10 Fine Art Books. This is going to focus on my interests of drawing, painting, artists, art business and what's new - as detailed below. I'd also add that, yet again, I've learned something about the art books available on Amazon while creating this listing! FIRST is that the listing will be UPDATED EVERY MONTH. I'll be identifying the fine art books which are the top rated and best selling books across various Amazon Art Books categories - including books yet to be published. As I update, I'm expecting some books to change while perennial best sellers are likely to stay the same. SECOND relates to how this list is compiled. This listing in no way repeats the listings for different categories for arts and photography on amazon.com. That's because I find that the Amazon categories can be very confusing and books are often listed in multiple and incorrect categories. Just click a link and go straight to that topic - and find out which are the top 10 art books in May! So if you want to keep up to date with which art books are coming up the charts and are highly rated or selling well, why not bookmark this new 'resources for artists' site. I'll be updating it next at the end of June/beginning of July. Feel free to share this link via Twitter or Facebook or any other way in which you share sites. Posted by Making A Mark on Saturday, May 29, 2010 3 comments Who's linking to this post? 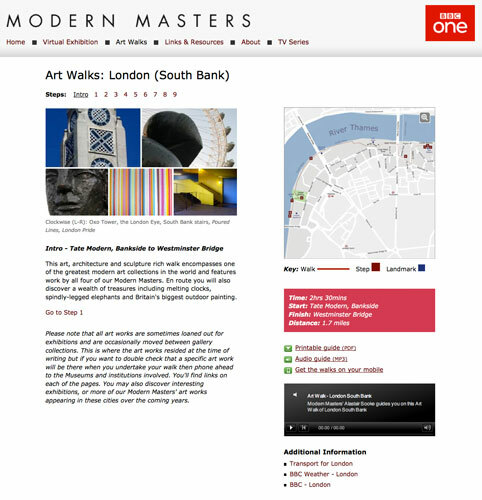 The current BBC series "Modern Masters" about four artists who changed the world has generated a unique resource. The website includes a set of art walks in different UK cities. I think it's a totally brilliant idea - and one which should be adopted by many more cities and media websites. Posted by Making A Mark on Friday, May 28, 2010 1 comments Who's linking to this post? What's your favourite Art Business Book? Today I published a new "resources for artists information site called "The Best Art Business Books". You can read the reasons why in this post in Making A Mark Reviews - but some of you will recall my recent rant about Amazon assigns ludicrous categories to Art Books (11 May 2010)! I'm still developing this very new site. One of the main things I want to do is include an opinion poll on it to find out which art business books which are regarded as the most useful books for both emerging and professional artists today. That means I need to have a pool of books to list. So to do that I need to know which books have helped you the most! helped you to be an artist! Which are the art business books which make a difference? Which books deserve to get listed in my opinion poll on my new site? If you've written a book review of your favourite art business book (or books) I'd love to have the link as I'm including links to reviews in the new site. Posted by Making A Mark on Wednesday, May 26, 2010 1 comments Who's linking to this post? Yesterday evening, at the Mall Galleries, Adam Binder's stunningly simple bronze sculpture of a polar bear on an iceberg - "Sinking Feeling" - won him the title of Wildlife Artist of the Year 2010. The title, supported by the David Shepherd Wildlife Foundation (DSWF), comes with a cash prize of £10,000 generously donated by the exhibition sponsors. Binder received his prize from actor Robert Lindsay who is a friend of DSWF, at last night's reception at the Mall Galleries in London. The exhibition includes over 100 works of art short-listed for the competition are on display and for sale, to benefit endangered wildlife. The Exhibition runs until Saturday 29th May. You can see the works on display on the exhibition website. You can also download the exhibition catalogue. I'm also going to be doing another post later in the week to give you a sense of what the works look like in the show. Meanwhile this post is going to focus on the five prizewinners. Click the link in the artists' names to visit their websites and see more of their work and where it is exhibited. I had an opportunity to talk to Adam after the presentation. His main field of artistic endeavour until now has been in art collectibles including netsuke marble resin sculptures and medium and small bronzes - unless commissioned. The bronze sculpture is an off white due a process of patination using a special chemical recipe. Based in Meysey Hampton near Cirencester, his studio is open to visit plus he's got a number of galleries around the UK which display his work but no gallery in London as yet. I'm sure a very sensible gallery will be making him an offer very soon! 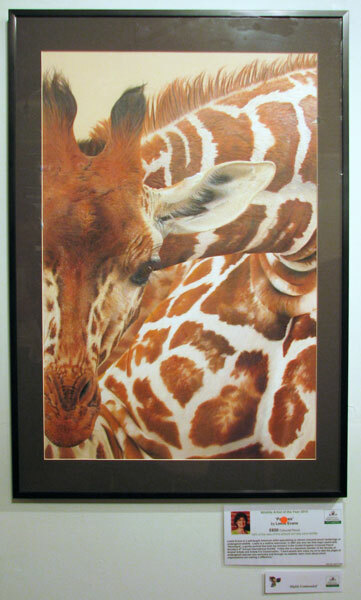 Paul Barlett is a self-taught artist with a PhD in Animal Behaviour. He is an Associate Member of the Society of Wildlife Artists and wib the Birdwatch Artist of the Year in 2006 at their annual exhibition. This year he will be holding his first exhibition of new works in the USA. 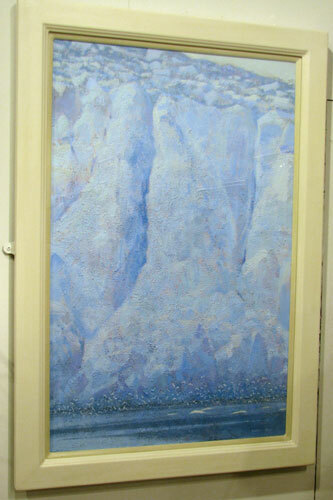 You can see more of his Artic Portfolio on his website. A very well excecuted painting. You can almost hear the thunder of hooves and feel the heat and dust being kicked up. 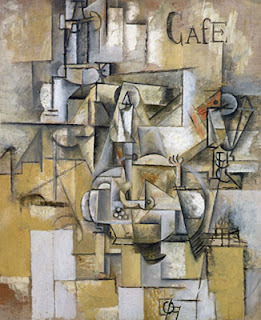 I love the modernistic approach of this painting. A very worthy category winner. I spoke to Davina about how she got into wildlife art. It started for her with a visit to Africa when she was 13 and has continued ever since. She has been the artist in residence at a Gorilla project in Gabon and produced a painting which won her a Highly Commended at last year's show. It's as if the artist grasped the nud beneath her feet and conjured up the magic of Africa - here is humour, pathos and personality. 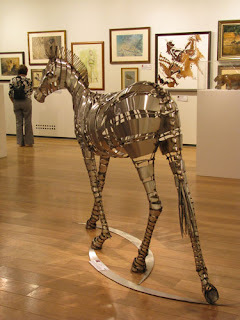 The sculture is ceramic and mixed media - the latter including horse hair and bristles from her sweeping brush. It took her about a week to make. 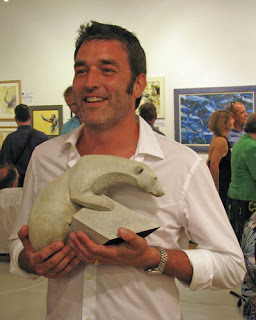 I'm guessing that one of the things she is most pleased about is that her sculpture has been bought by David Shepherd! 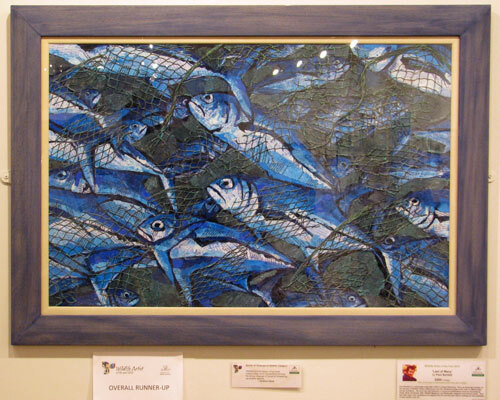 Her work can be seen in these art galleries. 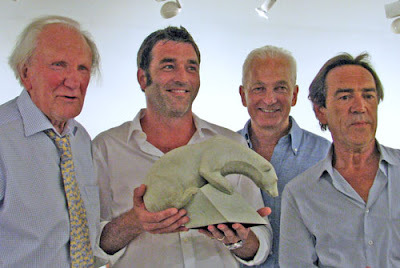 David Shepherd's idea to use his passion as an artist and conservationist to engage fellow artists in raising awareness and funds for wildlife is inspired. 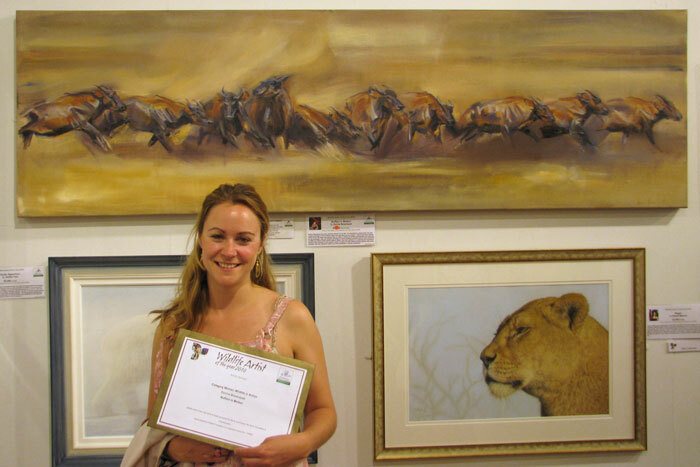 The result, the Wildlife Artist of the Year competition, has produced three successive and wonderful exhibitions of wildlife art contributing thousands of the pounds to the protection of critically endangered mammals and their wild habitats. I feel honoured to be associated with David, this competition and his wildlife foundation. 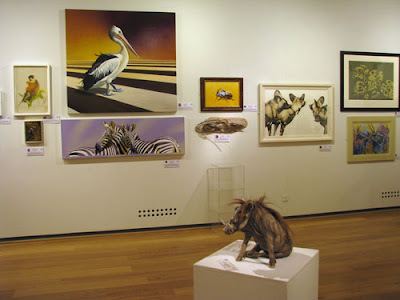 For those who are interested in animal and wildlife art and who can get to the exhibition I suggest you make sure you pay it a visit at the Mall Galleries before it closes on Saturday 29th May. Posted by Making A Mark on Tuesday, May 25, 2010 2 comments Who's linking to this post? 24th May 2010 - Who's made a mark this week? This is the sketch which I did yesterday because I went out in the sunshine rather than write this post! 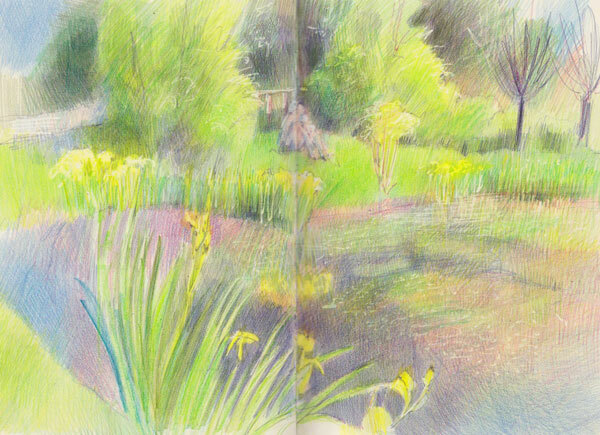 It was very 'Spring' green although maybe not quite as green as this sketch would suggest! Congrats to Margaret Dyer (Small Pastel Studies by Margaret Dyer) who was runner up in the cover competition run by American Artist Magazine - see American Artist Magazine, July issue is on the stands.. Thanks to Jan Blencowe (Jan Blencowe The Poetic Landscape) for highlighting Renee Phillips's post The Artrepreneur Coach": Juried Competitions: How to Improve Your Odds and listing 44 things you should know! I read an interesting piece tonight about an artist, perhaps intermediate level, who was wondering if she should give lessons in oil painting to people who asked. Her dilemma wasn't whether she was experienced enough in technique and teaching to do, but that if she taught people, they would become her competition. Rome has got a new museum for 21st century art. The National Museum of 21st Century Arts, better known as the Maxxi, will be Italy's first state museum for contemporary art and architecture and has been designed by Zaha Hadid. Read Rome Turns to the Art of Today. It opens on May 30th 2010. This display features prints by four of the 20th century's greatest artists: Henri Matisse, Pablo Picasso, Salvador Dali and Andy Warhol. Over 50 works drawn from the V&A Museum's collections have been selected to illustrate these modern masters' engagement with the printed medium. Both celebrated and less familiar prints in a range of techniques are included, spanning a period of 75 years and representing one of the most creative and diverse artistic periods in the history of western art. This is an account of A Visit to the 2010 American Masters Show SCNY at the Salmagundi Club in New York. 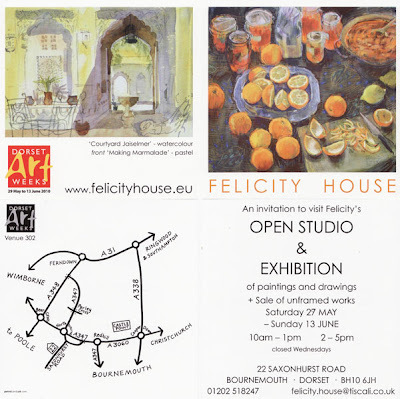 Felicity House has sent me an invite to come down to her Open Studio held during Dorset Art Weeks. It's an absolute model of what an invite to an Open Studios should be: good-looking art which is representative of the artist, dates and times and all the information I need to get there including a map! Plus she's got it on her website too! 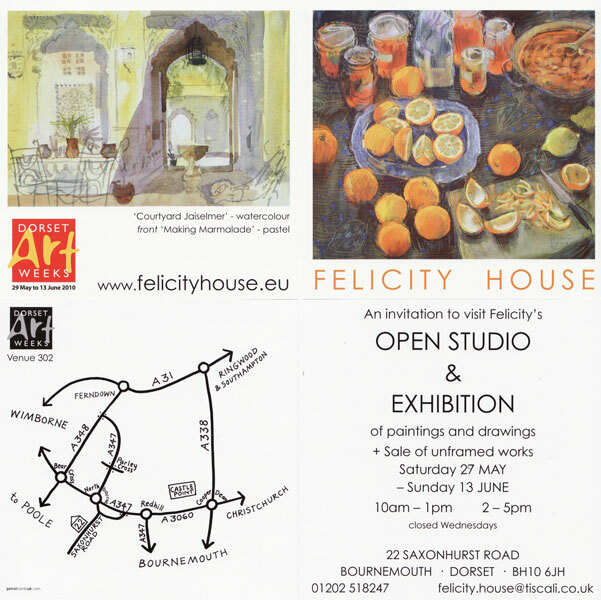 Felicity is venue 302 in Dorset Art Weeks schedule of over 600 artists in its 10th biennial event. I'm afraid I'm not a fan of their website. Its map mode is not at all obvious. See if you can spot the link in the main menu! However, once you've found it, if you click on a pin it tells you what the studio is about. Dorset Art Weeks last from the 29th May to 13th June. Andy Warhol - King of Pop. You can also see some BBC archive footage of Picasso at home with his family. So who knew Picasso was a cat lover? Yet another art theft and this time they're asking Who failed to switch on the alarm? The Imperial War Museum will host a one day Conference on 9th June which confronts a difficult issue - the making, exploitation and re-appropriation of public memory surrounding memorials. The immediate context is the display at Tate Britain concerning Moore and Auschwitz. Henry Moore chaired the Jury of an international competition (1958-9) to design a public memorial to the ‘Victims of Fascism’ at Auschwitz-Birkenau, although a commission was never realised. The conference explores the dilemma that faced that jury - how to mark a political event with a public memorial. Ulrike Smalley takes a closer look at art produced in response to the Holocaust. CPSA Lightfastness Handbook Version 6 - out now check out how to get hold of it and how much it costs. what happens when you suspect a Big Brand has actually ripped off your original designs? Is there anything you can do about it or is it unrealistic to expect a large corporation to take any notice whatsoever? High-profile users, including developers at Google, security experts and journalists, have quit Facebook and posted instructions on how others can do the same. Nascent privacy-conscious social network Diaspora has been earning slews of favourable ink. Wall Street Journal identified this Facebook, MySpace Confront Privacy Loophole - which gives rise to serious concerns about the assurances on privacy given by Facebook. The simple answer is to avoid sharing any personal data beyond what is essential on Facebook. The more rigorous answer is government regulation and big fines linked to a percentage of their total revenue stream for advertising for breaches of privacy standards. I guarantee they'll then address such issues. Techie: How to remove a CD or DVD from an iMac is me recording what to do next time I fail to engage my brain. Please comment if anybody knows the answer to Robyn's problem - persuading the computer that the disc has been removed! Apparently, according to the Art Newspaper, Posh and Becks are the new power couple in contemporary art. Personally I didn't think they had quite accumulated the billions required to be a high status collector these days. However it is interesting that they have invested in art and, it is said, patronised the White Cube to do so. The 'announcement' looked suspiciously like indirect White Cube advertising to - aimed at the WAGs of the upcoming World Cup. Does this mean art has been 'elevated' to the status of something for the 'fashionistas' to talk about while the boys are off running round a pitch kicking a ball? Posted by Making A Mark on Monday, May 24, 2010 5 comments Who's linking to this post? Categories art, art blogs, Art Galleries and Museums, art news, art supplies, copyright, exhibition, making a mark reviews, social media, who's made a mark this week? I'm off to the park to draw irises! Who's made a mark this week will be delayed until tomorrow as we've got exceptionally good weather today and I want to be out in it! 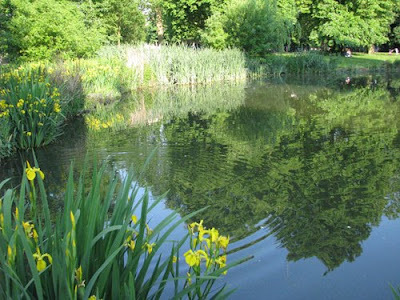 This is where I'm going - to Victoria Park - hopefully to draw irises near the East Lake. Some of you may remember this post from last year - Hokusai, Van Gogh and the iris paintings which was triggered by trying to draw irises. Have any of you been drawing them this year? Posted by Making A Mark on Sunday, May 23, 2010 4 comments Who's linking to this post? It's frightening when you've got a CD or DVD in your iMac AND the drive disappears from Finder AND the eject button on the keyboard does not work. It happened to me when I ejected a CD and then reinserted it too quickly - which is something I won't be doing again in a hurry - which is another way of saying I'll make sure I've got the brain engaged first next time. However for when I'm being totally clueless before my second cup of tea in the morning this is my reminder to myself which I thought I would share with others! This is how you get a stuck CD / DVD out! Make sure the CD or DVD disc is not in use. Quit all applications that are using files on the disc. your iMac will whirr and the disc will eject! You can now breathe again! I'm assuming the process will probably also work with the SD card slot although that's less of a problem as part of the card is always visible. I absolutely cannot vouch for any of these methods but thought it might be helpful to make a record of them here - just in case! It's been suggested to me that I need to update my Journal of an iMac Virgin for those of you would like to know how I'm getting on with my new 27" iMac after a bit more than two months of use. In the meantime I'm now going to watch another episode of the BBC Modern Masters Series on my 27" HD screen - about Matisse. Posted by Making A Mark on Saturday, May 22, 2010 10 comments Who's linking to this post? Who failed to switch on the alarm? Often when I walk round museums I can't help speculating how many millions of pounds worth of paintings are in one room. Sometimes the sums are simply breathtaking. I've then speculated also about how much top-notch security must be involved in keeping those paintings safe. Inevitably I then marvel at the way in which, year after year, so many of the eminent museums around the world do a really excellent job of keeping our art heritage safe from thieves - and those greedy people who need to boost their self-esteem with some stolen art! However apparently not much is kept safe if somebody fails to turn on the alarm system! As the Musée d'Art Moderne de la Ville de Paris in Paris found out this morning when they discovered that a window was broken and five paintings by Picasso, Matisse and other great artists had been stolen - and the alarm had not gone off. I was not surprised to find out that 90% of all art theft involves somebody on the inside of the museum. After all if the technology all works then some sort of human failing is all that is left. The paintings, stolen overnight on Wednesday, are estimated to be worth just under 100m euros (£86m; $123m). However, I was pleased to hear the man in charge of the Art Loss Register explaining that their real value lies in what those paintings represent in terms of explaining the development of the individual artists and of modern art in general. The ALR is now the world’s largest private database of lost and stolen art, antiques and collectables. Its range of services includes item registration, search and recovery services to collectors, the art trade, insurers and worldwide law enforcement agencies. These services are efficiently delivered by employing state of the art IT technology and a team of specially trained professional art historians. Let's hope the art stolen last night is also recovered. Note: The Museum is not to be confused with the Musée National d'Art Moderne which is housed in the Centre Pompidou. This one is for the City of Paris's modern at collection - not the national modern art collection. Posted by Making A Mark on Thursday, May 20, 2010 3 comments Who's linking to this post? Birmingham Museum and Art Gallery has an absolutely enormous collection of 2,300 PreRaphaelite paintings and drawings. Last year it launched a truly impressive Pre-Raphaelite Online Resource website which uses Microsoft Silverlight technology. This has a Deep Zoom function which allows the viewer to see the intense colours, brush strokes and pencil etchings in high quality detail. Once you've clicked on one of the images - particulary if you own a 27" iMac with an HD screen as I do - your mouth drops open pretty fast! The level of detail is absolutely stunning. The level of documentation is also extremely thorough. It's a research resource which sets a standard that many will find hard to beat. In my view, it's one of the most impressive art websites I've ever seen on the Internet in terms of the quality of the image which you can see. I'd venture to say it's even better than viewing in a gallery! One drawback is that you do need to install Silverlight to see it - however you get the very reward when you see the quality of the pictures which result. The website provides you with a link to do this. The website was launched in July 2009 and has been very well received. It was named best in the Arts and Culture class of the Interactive Media Awards in September 09 and has been shortlisted for two Drum Awards for the Digital Industries (DADI). In January this year the Pre-Raphaelite Online Resource won a BETT 2010 award in the category of Digital Collections and Resource Banks. 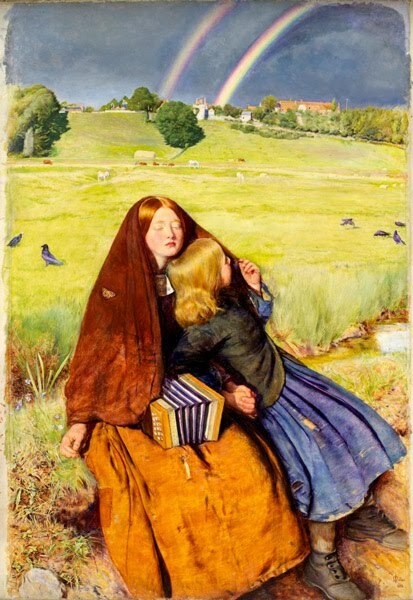 Birmingham Museums & Art Gallery received funding from JISC to digitise the Pre-Raphaelite collection and make it accessible online for the education community. The resulting Pre-Raphaelite Online Resource provides full record information and allows users to examine images in great detail. You can choose to browse the online collection, make simple searches or to interrogate the collection data using filtering tools. The ability to filter the collection in this way should be particularly useful for study and research. You can also interact with the online collection by creating your own personal collections of images and by discussing the works with the online community. One of the major benefits of this project is that it is accessible to everybody in the Internet. Some of the other digitisation projects have spent a lot of money digitising material only to make it accessible via higher education institutions only - which I consider to be an extremely narrow and patronising perspective on how learning takes place in a web 2.0 world. In contrast this project makes the Pre-Raphaelites accessible to all. JISC – the Joint Information Systems Committee – is a joint committee of the UK further and higher education funding bodies and is responsible for supporting the innovative use of information and communication technology to support learning, teaching, and research. For more information or to browse the collection visit Pre-Raphaelite Online Resource website. Posted by Making A Mark on Wednesday, May 19, 2010 1 comments Who's linking to this post? The National Portrait Gallery in London has published the Call for Entries for the Taylor Wessing Photographic Portrait Prize 2010. The closing date for this very prestigious competition is 18th July 2010 and you can find out who can enter and how to enter below. I've not featured the Taylor Wessing Photographic Prize on this blog previously - but am going to do this year since discovering that it was one of the Top 10 Art Exhibitions in the UK in 2009 The National Portrait Gallery's exhibition for the Taylor Wessing Photographic Portrait Prize 2009 actually came sixth in terms of the number of visitors. Submissions are now being invited for the Taylor Wessing Photographic Portrait Prize 2010, ‘the leading international photographic portrait competition’, which celebrates and promotes the very best in contemporary portrait photography. Entry is open to photographers from around the world, aged 18 and over. The winner of the Taylor Wessing Photographic Portrait Prize 2010 will receive £12,000. Around 60 photographers will be selected for the exhibition at the National Portrait Gallery which in 2009 received nearly 250,000 visitors. Last year the Taylor Wessing Photographic Portrait Prize received 6,301 entries and was won by Paul Floyd Blake, 47, for his portrait of 13-year-old swimmer Rosie Bancroft, who hopes to compete in the 2012 Paralympic Games. Prizes were also awarded to Vanessa Winship, Michal Chelbin and Mirjana Vrbaski. Basically if you were over 18 on 1 January 2009, live anywhere in the world and can create a portrait using a camera then you should study the entry requirements. In the past entries have been submitted by gifted amateurs, photography students and professional photographers. You can enter up to 6 photographs taken after 1 January 2009 (and you must be able to demonstrate proof of this). The exhibition will run at the National Portrait Gallery, London, from 11 November 2010 - 20 February 2011, admission £1, before touring to The Sunderland Museum and Winter Gardens from 16 April - 26 June 2011, and one further tour venue. A 72 page catalogue (RRP £15) featuring all of the selected photographers accompanies the exhibition. ELLE magazine (UK) will choose one photographer selected for the exhibition to shoot a feature story. They will pay standard commissioning rates and expenses to the photographer chosen. ELLE is the world's biggest-selling fashion magazine with 39 editions worldwide with the British edition selling 195,455 copies a month (ABC January-December 2009). This year sees the introduction of a new entry process. You can enter online by completing an ENTRY FORM. Entry forms will NOT now be accepted on the day when you deliver your prints. All entry forms must be received in advance, either online or by post, by the 18 July 2010. Entrants are advised to read the entry instructions carefully below before submitting their applications. Guidelines for the delivery/return of postal/courier entries will be provided once your entry has been received. All works must be delivered between: Monday 2 – Friday 6 August 2010 (09.00 – 17.00 hrs only). Proof of posting will not be accepted as proof of receipt. All costs incurred by postal/courier services (including customs charges and any import duties) must be paid for in advance by the photographer. Important – application forms will not be accepted during this week. Applications MUST be received in advance, either online or by post, by Sunday 18 July 2010. Collection of work not accepted: Photographers will be notified of the judges’ decision by email or by post by Wednesday 25 August 2010. Works not collected by 10th September will be disposed of. Further information is available from the National Portrait Gallery website. Posted by Making A Mark on Tuesday, May 18, 2010 0 comments Who's linking to this post? 16th May 2010 - Who's made a mark this week? Museums at Night starts tonight! 9th May 2010 - Who's made a mark this week? How many people agree with Nick? Art magazines in the UK and USA - can you help? 2nd May 2010 - Who's made a mark this week? Have you bought a painting DVD?